The city of Jodhpur, painted in it’s iconic shade of blue is home to the magnificent Mehrangarh Fort that stands out as a major attraction to travellers and tourists. The vicinity of the hostel is all-encompassing with all tourist attractions just a few minutes ride from the hostel. Moustache Jodhpur is the locus of social and cultural gatherings in cosy surroundings, catering to people from all walks of life. The hostel is equipped with a spacious common area, lovely balconies, comfortable dorms and secluded private rooms. Indulge yourself in the rollicking atmosphere with an in-house theatre, innumerable board games and delectable flavours for your tongue served by our in-house restaurant. 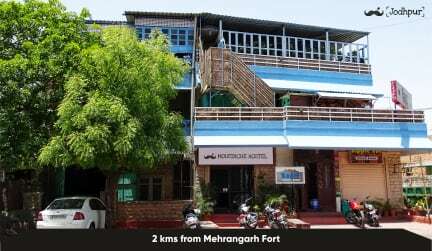 Wander between the azure sky and earth of Jodhpur with your considerate comrade, Moustache Hostel! 1.We send you an email with detailed directions to the hostel and how to avoid the common Jodhpur scams within a few hours of receiving your booking. Please read this email carefully. Look at your spam folder in case you do not receive the email within 12 hours. 2.If you are arriving very early, please make sure you book the previous night. The earliest check-in is 12:00pm on the day of booking (e.g., for a booking of the 12th, earliest check-in is 12:00pm on the 12th). You are welcome to wait in our common room if you would like, but for 3-4am arrivals, we recommend booking an extra night. 3.Credit cards accepted with 2.5% additional bank charge. 5.No children below the age of 18 allowed. 6.24-hour check-in permitted but earliest check-in for the night is 12:00pm. latest check out is 10:00AM. 7.Residents of Jodhpur are not permitted to stay at the hostel. 8.No alcohol allowed on premises. 9.We need a valid passport and visa for foreign nationals and a valid photo ID and address proof for Indian nationals during check-in. 10.We have a strict advance payment policy at check-in. 11.We are a travelers' hostel and do not encourage group stays and long stays. For bookings of more than 4 people or stays of more than 7 days, please email us first to get authorization. Else, we reserve the right to terminate your booking without any refunds. Rooftop restaurant serves the best food I’ve had in India. Fantastic themed decor—hanging chairs and mustache bed curtains are a cute touch ;D Clearly a generous effort was put into the common areas and establishing a strong social environment. The demographic was overwhelmingly French?? Don’t know if it was coincidence or seasonal; in any case, nice for me as I’m learning the language. 20/10 for the staff member with the hoop earrings... helloooo handsome. J’adore. Appelle-moi! Absolutely loved our stay here. Great walking tour which meant we got to see parts of Jodhpur we wouldn't have necessarily have been and made it easy to make friends at the hostel. Our dorm was such good value and amazing AC meant we had great nights sleep even though it had been 42 degrees that day! Staff are so friendly and helpful. Only downside is the location is not in the old part of the city which is the bluest part so have to get tuk tuks to and from. Still would stay here again though! Awesome spot with heaps of friendly people to meet and chill with! Staff is hilarious and always give you the help you need! One of the best hostels I've ever stayed in. Staff is amazing, facilities are new, clean and beautiful. The rooftop restaurant is great and the beer is cold! 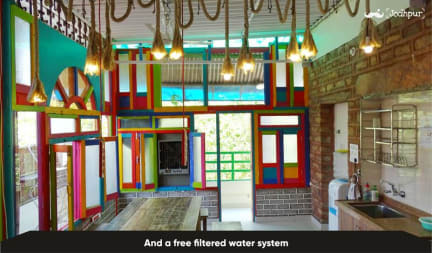 Moustache hostels are always good, but this might be the nicest I've seen in India! Just go! Very nice, especially for the price. Staff is crazy but in a good way. It was a short stay but a good hostel. Spacious dorms with privacy curtains on the bed. Great common areas. A kitchen to cook but also a great restaurant that served a good thali. As a female solo backpacker this was a great hostel to stay to meet people. The walking tour is the best way and it’s great. Shout out to the guide, he’s a legend. The free chai everyday was great. Rooms had a/c and we’re comfortable. Would recommend. The walking tour on offer is really good, so it was nice to have that option. The restaurant attached does very nice food and has a friendly atmosphere. And beer! Kitchen facilities great. The bathroom/loo to bed ratio could be a lot better and loo roll wasn’t replenished frequently enough.